Are you stressed out at Christmas? Yes, the Christmas season can get crazy busy, and moms can feel overwhelmed. With so many things to accomplish along with all of your daily responsibilities, this season can rob you of sleep, time for self-care, and precious peaceful and joyful time with your family. The truth is Christmas can be wonderful with a great plan! Coming up with a plan to get your Christmas tasks done will help you grab back those special moments with your family and give you the time you need to take care of you as well! It is hard to keep Christmas at a reasonable level when we are bombarded with commercials and television shows suggesting to us that Christmas has to be filled with expensive gifts, fancy decorations, and an overwhelming push to attend every single holiday event in the city, so our kids don’t miss out. ONCE UPON A TIME, I WAS A STRESSED OUT CHRISTMAS MOM! During the holidays I was cooking, cleaning, shopping, decorating, working, parenting, and this list could go on and on. I am sure many of you can relate! I started to feel like a hamster after drinking espresso, spinning on the wheel, getting nowhere, but moving as fast as I could go. I was literally shopping til’ I was dropping. I would look at photos of my son and myself decorating cookies… he beaming with fun and I was sporting dark circles under my eyes from lack of sleep. I knew something had to change. But my heart said I needed this, for my family, for myself, and to hold fast to my most-loved traditions. I started researching ways to get organized, cook with more efficiency, plan ahead, and NOT break our budget. As I studied, I became very successful at cooking from scratch during the busiest time of the year, shopping with my head and heart, not just my pocketbook and plastic, and keeping our traditions but not overstretching the calendar so much that the kids, my husband, and myself got cranky. I knew I could not keep my tips a secret because somewhere there was a tired mommy who just might need a little boost. She wants out of the chaos of Christmas and back to the sparkle of joy in her heart for the season. And that is why I wrote this ebook. Which now comes with a free 60+ Paged Printable Holiday Planner to help you complete the suggestions in the book! 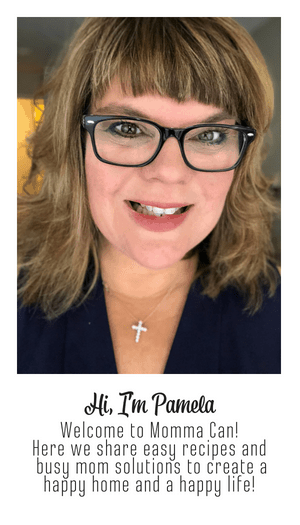 Jana mom of four: This book is a life saver for the overwhelmed mom. It starts with the basics, having a plan, deciding what your perfect Christmas looks like and then setting tasks to get there. I so needed this!What’s inside the eBook? Susanne: Pearl Street Designs: This is THE BEST guide to make it through the holiday season, from start to finish Pam has it all covered! Thanks for making my holiday planning sparkly and chaos FREE!! 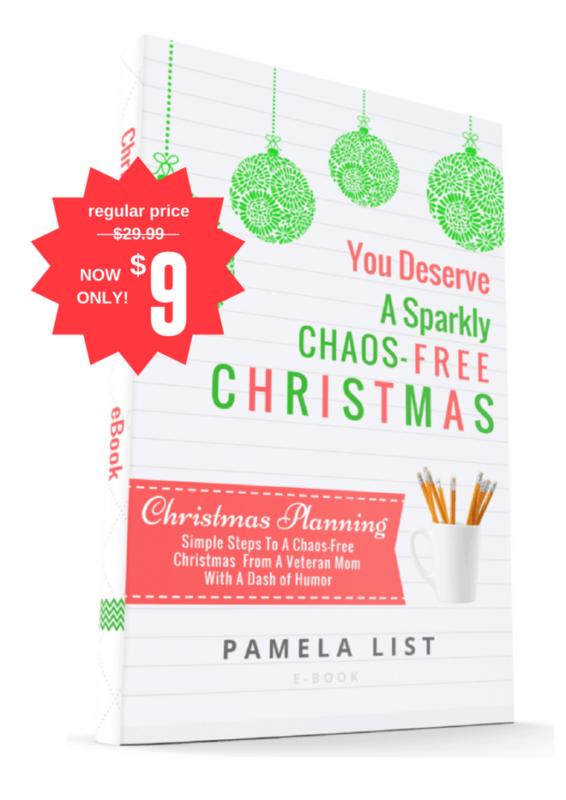 17 Chapters of Simple Steps and Tips to plan your Christmas season by a Veteran Mom of 29 years with a dash of humor and lots of sparkly joy! A bonus daily agenda printable with a generous doodle/bullet journal spot to allow you the take notes or get super creative. Simple steps to create a Sparkly Christmas Plan that suits your family’s needs. Determine a budget and make those dreadful post-Christmas credit cards bills a thing of the past. Learn how to give with your heart and not accumulate high credit card debt. Learn when to stop decorating and pat yourself on the back for a sparkly job well done. Learn tips on gift wrapping supplies and when to mail Christmas cards. Plan Christmas Meals like a Pro! Would love to read and review this on my blog! I am dreading the Christmas hub-bub and stress. No matter how hard I try, I am still scrambling at the last minute every year to get gifts, decorate and try to make our Christmas perfect. I need to quit worrying about perfection and just learn to enjoy the moments.